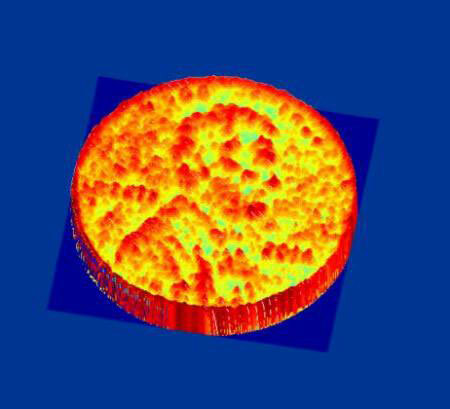 (Nanowerk News) Any time you want to make an exact copy of an object with a 3-D printer, the first step is to produce a high-resolution scan of the object with a 3-D camera that measures its height, width, and depth. Such 3-D imaging has been around for decades, but the most sensitive systems generally are too large and expensive to be used in consumer applications. The work, done in the laboratory of Ali Hajimiri, the Thomas G. Myers Professor of Electrical Engineering in the Division of Engineering and Applied Science, is described in the February 2015 issue of Optics Express ("Nanophotonic coherent imager"). In a regular camera, each pixel represents the intensity of the light received from a specific point in the image, which could be near or far from the camera -- meaning that the pixels provide no information about the relative distance of the object from the camera. In contrast, each pixel in an image created by the Caltech team's NCI provides both the distance and intensity information. "Each pixel on the chip is an independent interferometer -- an instrument that uses the interference of light waves to make precise measurements -- which detects the phase and frequency of the signal in addition to the intensity," says Hajimiri. Because the coherent light has a consistent frequency and wavelength, it is used as a reference with which to measure the differences in the reflected light. In this way, the NCI uses the coherent light as sort of a very precise ruler to measure the size of the object and the distance of each point on the object from the camera. The light is then converted into an electrical signal that contains intensity and distance information for each pixel -- all of the information needed to create a 3-D image. The incorporation of coherent light not only allows 3-D imaging with the highest level of depth-measurement accuracy ever achieved in silicon photonics, it also makes it possible for the device to fit in a very small size. "By coupling, confining, and processing the reflected light in small pipes on a silicon chip, we were able to scale each LIDAR element down to just a couple of hundred microns in size -- small enough that we can form an array of 16 of these coherent detectors on an active area of 300 microns by 300 microns," Hajimiri says. The first proof of concept of the NCI has only 16 coherent pixels, meaning that the 3-D images it produces can only be 16 pixels at any given instance. However, the researchers also developed a method for imaging larger objects by first imaging a four-pixel-by-four-pixel section, then moving the object in four-pixel increments to image the next section. With this method, the team used the device to scan and create a 3-D image of the "hills and valleys" on the front face of a U.S. penny -- with micron-level resolution -- from half a meter away.